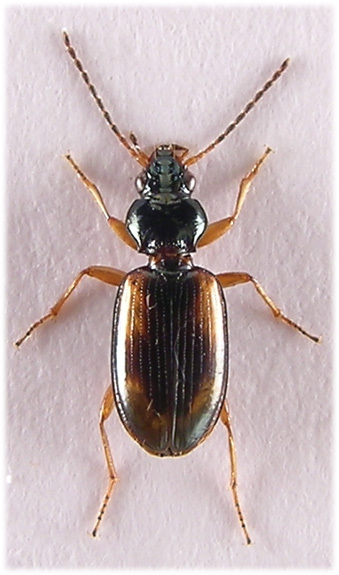 Occurs throughout the British Isles and is generally common, according to Luff one of our commonest Bembidion species and this is certainly the case locally. The species is found throughout our area in damp or even waterlogged situations and the majority of records have been from two distinct habitats although they are by no means confined to these. 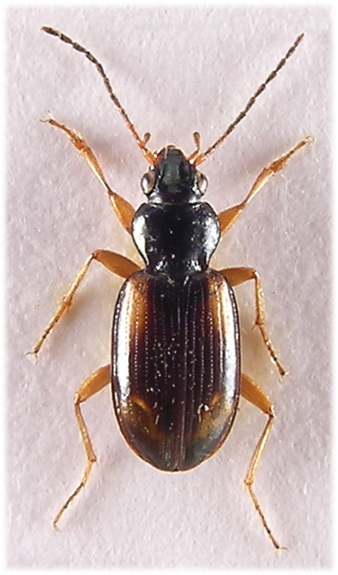 Firstly they may be found year round under logs or debris under heavy shade on damp soil, in this situation we usually find them in pairs or small numbers. 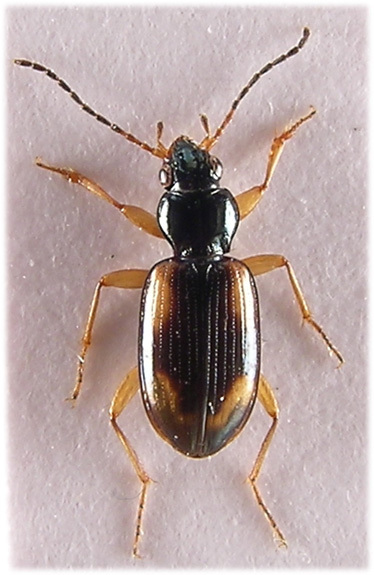 Secondly, and this is where we find most specimens, they occur at the margins of water in moist situations and are easily observed in hot sun on bare waterlogged soil adjacent to dense vegetation, here they usually occur in numbers and alongside populations of other carabids e.g Bembidion dentellum, B.lunulatum, Paranchus albipes or Elaphrus cupreus. In this situation they will scatter rapidly when disturbed, going into soil crevices, under debris or into vegetation etc. but on several occasions we have observed them running into very shallow marginal water, crawling rapidly on the submerged soil and emerging some distance along the waters edge still running. Beyond this they may be found in many situations e.g. in the spring before the vegetation becomes dense on the south western (wet) part of Common moor. 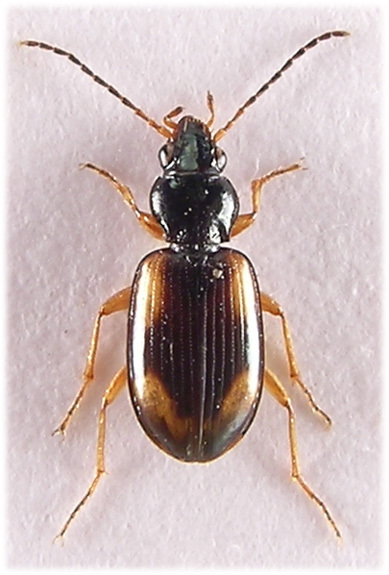 B.tetracolum can be found in abundance running across open ground in sunshine and we have recorded them from all local rivers. Specimens are occasionally found under logs in woodland openings where the soil is damp and, unusually, we have found them on the open, dry farmland adjacent to Whippendell wood. We have yet to record them from local domestic gardens and they have been mostly absent from parkland pitfall traps, in general they seem to shun human activity. 4.9-6.1mm. A stout species: compare the relative sizes of head and elytra to pronotum. Forebody shining, usually with a distinct metallic green lustre, very occasionally specimens occur with a strong blue reflection. Antennal segments dark with base lighter, first two segments testaceous. Palps yellow, terminal segment reduced. Head smooth and shiny, almost impunctate but for two setiferous punctures beside eyes, constricted behind eyes. Frontal furrows shallow and weakly converging anteriorly, sometimes almost parallel, not continuing onto clypeus. Labrum and base of head dull, microsculptured. Pronotum strongly cordiform and much narrower than elytra, lateral border visible to front angle from above, disc without microsculpture (cf. B.bruxellense). Basal fovea wide and deep, ridged externally and with large, often confluent, punctures which continue across base, hind angles sharp, approximately right angles. Elytra dark with pale humeral and subapical macula, these are always separated by the ground colour which extends to the margin (in B.maritima Stephens these macula are joined laterally), surface dull to transverse microsculpture (X60). Shoulder stria rounded from lateral margin, appearing to stop above the base of the fourth stria. Dorsal punctures (usually two) situated within or adjoining third stria. All stria strongly punctate, becoming weaker towards apex. Second stria weaker than first subapically. Seventh stria evident from base to at least middle, weaker than sixth, may be visible to apex as a weakly impressed line or longitudinal series of small lines. Eighth stria strong and deep, almost impunctate and joining marginal stria in basal half. Legs entirely pale testaceous. Wings usually reduced. Basal protarsal segment dilated in the male.